Women frequently fear that they are having a breakdown, or that they have some serious illness when menopause symptoms disrupt their lives out of the blue. Allowing women to voice their fears in a group, and answering their questions, greatly reduces stress and allows them to choose whichever form of help feels best – selfhelp alone or with medical, psychological or complementary therapies. 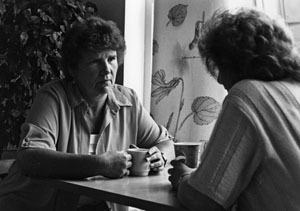 Using the “Menopause Swings and Roundabouts” toolkit with a group, or individually, can allow women to explore their understanding of their own menopause, allow discussion of a wide range of options for dealing with their problems and allow much shorter, better-informed and focused medical consultations, if they need to seek medical help at all. The toolkit contains every thing you need in order to run fun and successful groups about the menopause. You can browse through it online before deciding which sections to download to your computer. The whole toolkit is quite a large file, so we have diviided it into sections to make it more manageable. It uses photos of a wide variety of women in the menopause years, interactive quizzes, daily symptom charts, worksheets and handouts to enable any group of women to share their experiences, have some fun, learn how to cope with menopause problems, make new friends and face the future with confidence and a sense of fulfilment. 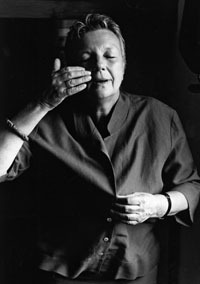 Apart from the unsettling changes many women experience at this time - it’s also a signal that we may well be half way through our lives - with all the questions which that might raise as to our right to find meaning and fulfillment in life - to dream and take time to put some of our dreams into action before we are too old. We won’t get a second chance! You don’t have to have bad menopause symptoms to benefit from using this toolkit – as there are many life changes that occur around the time of the menopause – and spending time preparing for the next stage of life can give you a smoother passage as well as allowing you to understand how difficult menopause symptoms can be for other women. If you can get a group of women together to take turns in running the toolkit sessions you will have more fun and get a much wider view of how this stage of life can be lived through successfully – and create a good support network which can be a life-saver when things get tough! So - how about a group of friends, family, people at your work or in your local community? It’s been used very successfully by such groups already.